In addition to being a faster, easier way to type your text, Swype also has easier ways to access the numbers and punctuation. For example, if you need to type an address with a street number, you don’t need to put the keyboard into symbol mode just for those few numbers. You will see numbers above the letter characters, so, for example, the number 4 is above the d. You simply hold down on the d and it will type the number 4 without taking you out of text typing mode. What I miss the most in on-screen keyboards is arrow keys – a way to move my cursor. If you touch the Swype key and drag your finger to the right, the ABC key, that puts your Swype keyboard into selection mode. You now have arrow keys, Cut, Copy, Paste, Select … even a Select All! 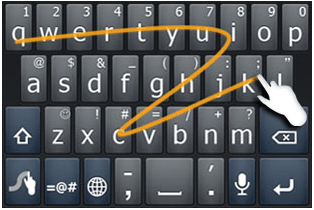 To see more of the capabilities of Swype, watch these additional basic videos on Swype. How Do I Get Swype? First of all, you need to check and see if Swype came pre-installed on your Android phone. It may be installed, but not selected. To check, you click on any text field – e.g. pretend to start an email and touch the message section to type. If you touch and hold on that field, you should see a dialog box pop up and the words ‘Input Method.’ Touch Input Method – you will see ‘Android keyboard’ and perhaps ‘Swype.’ If you see Swype, just touch it to make it your default input method. You’re done. Start Swyping! If Swype did not come pre-installed on your phone, then you need to download and install it. You won’t find Swype listed in your Marketplace where most apps are. Swype is taking it’s time rolling out the app. It is still in the Beta-Testing stage. It’s actually been closed to new users for months, but it recently re-opened the program. To get it, you need to go to the Swype website and register. You will then receive an email with a link to download Swype to your phone. It’s free. Just open the email on your phone and touch the link to download. Follow the instructions to install it, and further instructions to change your phones settings so that the Swype keyboard is your default input method. If the instructions in the email are not enough, here are installation instructions. Let us know what you think! We love Swype. Published by MrsGeek, in Blog. Tagged with Android, Droid, Swype, Typing on Droid. I’d rather not type at all if I don’t have to. I prefer to talk to my Droid using Vlingo, a speech to text tool. It will work for many applications on your Android smartphone. For those of use not of the means to get a new iPhone with Siri, this is pretty darned good. Give it a try! This is a great app. Much faster and easier but it’s not always perfect. It’s amazing how it knows what word I’m trying to type. Thanks for the tip. Thank you so much for turning me on to Swype. I never was very good at typing using my phone. Swype makes it so easy. I can’t believe it is so simple. Your instructions were easy to following and now that I have Swype on my phone I no my emails will be much easier and faster. Also less errors. Thanks again – I love all your tips and have used many of them!! !